The Guerlain of 2017 is not the Guerlain of yesteryear. The house that was so steeped in tradition and the old ways of doing things now feels as if it has firmly stepped into the modern age, shedding away the traditions of the past whilst celebrating the heritage and know-how that has given them their longevity and reputation. It’s a fine balance to tread but Guerlain seem to be navigating the tightrope walk with the gusto of a much younger brand and I for one, am all for it. If making beautiful yet commercial things gives them room to explore the art of perfumery further, then who am I to groan? Guerlain’s turning point started with La Petite Robe Noire and continues with their latest launch Mon Guerlain. But seeing as Guerlain is the creator of two of the greatest modern masculines (Habit Rouge and Vetiver) it’s no surprise that they have not neglected us gents with their new style and in 2014 they launched L’Homme Idéal, a thoroughly ‘Guerlain’ composition that is evocative of the Idéal man. What is the Idéal man though? Well, that’s the crux of it – the ideal man is whoever you want him to be and all Guerlain aims to do is make that gent smell marvellous at all times. The Idéal man is you and your fragrance is just the perfect finishing touch. There are currently a number versions of L’Homme Idéal to choose from; the original Eau de Toilette, a Cologne and an Eau de Parfum. The series presents a capsule collection of scent that allows a guy to make L’Homme Idéal his signature, with different interpretations to wear on different occasions and at varying times of the year. Let’s face it, once you’ve found the Idéal man (or in this case, the ‘Idéal scent’), you’re not exactly going to give him up for some other lesser mortal now, are you? Guerlain are increasing the size of their L’Homme Idéal wardrobe by adding the one key piece it’s missing: sportswear. That’s right, the ideal man wouldn’t be complete without some athleisure wear, regardless of whether he has ever seen the inside of the gym or not. 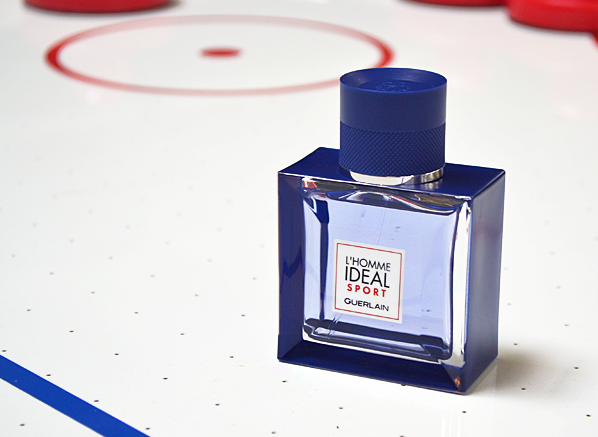 This new athletic fragrance, which Guerlain are describing as an “active water” comes in the most handsome shade of blue ever and it presents a light, yet kinetic scent that feels awake and alive. Let’s sniff! To understand L’Homme Idéal Sport, we must first take a look at its lineage. L’Homme Idéal, the original is a cheeky fragrance that presents an odour profile that straddles the line between being modern and wearable, whilst also paying homage to the patisserie style that has made Guerlain so famous in the past. Acting as a masculine counterpart to La Petite Robe Noire, L’Homme Idéal boasts bold notes of almond and tonka bean, which come together to create a crunchy amaretto accord, accented by the citrus bite of orange blossom. Underneath all of that is a robust woody base that has elements of sandalwood and chocolate, complimented by vetiver and leather, making for something entirely reminiscent of the bold masculines of the 1980s, but fine-tuned for today. L’Homme Idéal in its original guise is the life and soul of the party and the type of guy you’ll want to keep around. L’Homme Idéal Sport is the new kid in town and is notable because it’s the first Guerlain fragrance to showcase an aquatic note – something that the brand has shied away from despite the fact that they have previously made sport versions of some of their masculine classics. 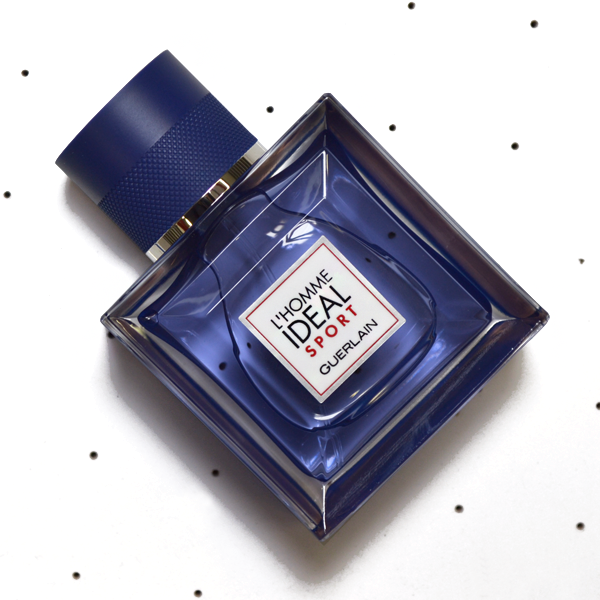 If, like me, you’re a bit shy when it comes to aquatics because they bring to mind Estate Agents who may have spritzed a little bit too liberally, you’ll be pleased to hear that in Guerlain L’Homme Idéal Sport, the marine vibe is subtle, hinting at just a touch of blue freshness that weaves perfectly with the spicy cardamom tones of the top notes. In style, the Sport version of L’Homme Idéal is more in tune with the Cologne than the original Eau de Toilette, but it’s fresher, still presenting the signature crunchy almond tartness but this time pairing it with musk, vetiver and patchouli to create the impression of something entirely transparent. There’s also a delightfully bright and classic neroli vibe to it in the top notes that really gives it that luxurious ‘Guerlain’ feel, reminding one that yes, this scent may be current and sporty but it’s still part of the world’s greatest fragrance dynasty (and you better not forget it!). Oh, and did I mention that the bottle is the nicest shade of blue ever? Other gym-goers will be envious of you when you pull this one out of your bag, that’s for sure. This entry was posted on Wednesday, May 31st, 2017 at 10:41 am and is filed under Candy Perfume Boy, Fragrance, Men, New products, Spotlight On. You can follow any responses to this entry through the RSS 2.0 feed. You can skip to the end and leave a response. Pinging is currently not allowed.